This weekend we have an open house featured in Fleming Island, Riverside, and Orange Park. Please come by and tour these beautiful homes this weekend. We have wonderful agents available to assist you and answer any questions you may have. 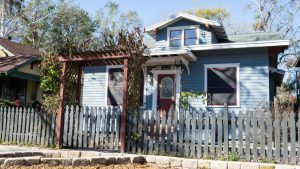 This 1920 Riverside Bungalow is just around the corner from the new King Street District & within biking distance to 5 Points, shopping, Memorial Park, St.Vincent’s Hospital & more! Most of the expensive updates have been completed – newer HVAC, electric & panel, plumbing, water heater & roof! The interior has been freshly painted & the home features: coffered ceilings, new flooring in office, new ceiling fan in LR, freshly refinished downstairs tub & surround with new pedistool sink, toilet & fixtures, HUGE pantry & storage closets, office next to the foyer w/ french doors, pocket doors to the kitchen, laundry shoot from the master bath upstairs to laundry area downstairs, lots of closet space & even a nursery/walkin closet in the master. Great storage shed too! Park off street or on street! Large (just under 1/3 acre! ), lot with fully fenced rear yard and fresh paint on the exterior and throughout the interior! Brand new stainless appliances in the kitchen, with a breakfast bar and spacious breakfast room! 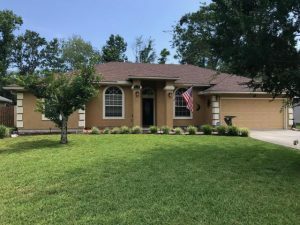 Home features 3 bedrooms PLUS a huge loft area that would be great for a den or playroom, a 2-story great room with fireplace that’s open to the kitchen, and separate formal living and dining rooms! The lanai is covered and screened with 2 access doors to the huge back yard, and the house is located at the back of the neighborhood on a cul-de-sac for privacy. Master bedroom on 1st floor and 2 bedrooms plus loft up. Access to all of Oakleaf’s fantastic amenities, and close to schools, shopping and NAS Jax. Don’t miss this one! LIVE THE FLORIDA LIFESTYLE in this beautiful POOL home! Ready for family fun and entertaining. 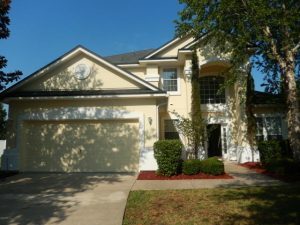 This 4 bedroom, 2 full & one 1/2 POOL bath offers 27 X 17 glass enclosed Florida room connected/open to kitchen for beautiful open view of the POOL and neatly manicured yard. Kitchen has eating area, breakfast bar and all kitchen appliances included. Formal dining rm, formal living rm/office area, and 4 bedrooms perfect for a large family. Owner’s bedroom offers attached bathroom with upgraded shower, garden tub, 2 sinks and 2 walk-in closets. Termite bond- renewed in May, roof and A/C only 3 years old! Extended concrete driveway fits extra vehicle.